How was this week? Actually I still sick with Bintulu. My 2nd Pday was horrible. I'm depressed using that computer that so slow and always no responding. At evening we were in Sister Kupa and Brother Loh's house. That was 1st I met them. We were inviting by them for dinner. Sister Doria's family took us there. Brother Loh seems not very well so we blessed him. 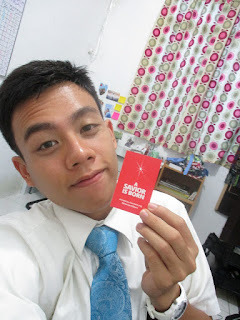 The next day we're being "Tripanionship" because Elder Chao's Companion was in Singapore for MLC. We were in Brother Serit's house and the circumstances was so funny because Sister Sits keep talking nonsense and that was so hilarious. LOL. Also we're in Sister Lita's house shared very short message. I'm so tired that day also I need a lot of patience here. Matthew 5:9 "Blessed are the peacemakers: for they shall be called the children of God." On Wednesday I feel not well, we went to clinic and the doctor said I having a chronic rhinitis :( We went to Sister Allesia's house afterward. I sicked with Coke at every single house. At evening we taught Chinese RC and I keep quiet forever. On Thursday we were in Rachel's house and we taught her about the Plan of Salvation. After that we waiting for E. Chao's companion back. After he's arrived at home. E. Trudo and I went to Sister Chewmeelan's house and we made FHE there. So much fun! Next day we were in Kampung Datuk to visited Sister Irene and Siti's house. We had an English class. E. Orgills here. On Saturday just like a normal day. I didn't exercise very well. We were in 5 miles again and we were in Sister Lily's/Chewmeelan's house. After done we went to time square mall and I got new pen and I love it. E. Chao told us that E. Orgills gave the Malay's people RM42 just for numb. This is for Sunday, my 3rd weeks in Bintulu branch. I missed Samarahan a lot. Sunday Sacrament Meeting just 30 people came. Evening I splited with Elder Lloyd for dinner in Sister Dara's house because my companion was sick. Elder Lloyd sicked with that food because he at a lot. We shared a Christmas video and I love Sister Dara's youngest boy. Hes so cute. 13 And on this day thou shalt do none other thing, only let thy food be prepared with singleness of heart that thy fasting may be perfect, or, in other words, that thy joy may be full.